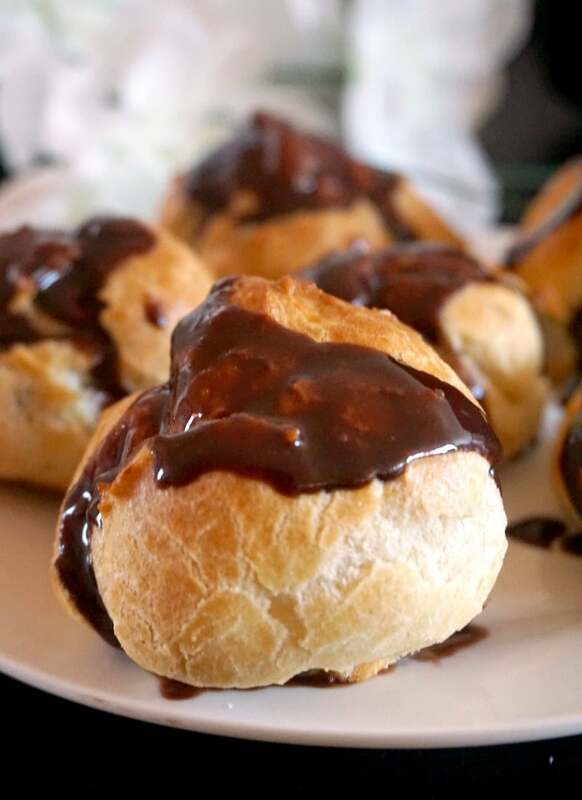 Profiteroles with vanilla cream filling and topped with chocolate sauce, one of the most delicious bite-size French desserts. The perfect chocolate treat for any party. You will probably hear more about French chocolate eclairs, although profiteroles or cream puffs are pretty popular too. And while the difference between them is minimal, they all share the same dough: the classic choux pastry (pastry dough). 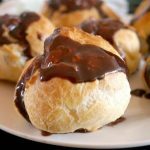 It’s a lot simpler to make them than you would think, and this is the only profiteroles recipe you will ever need. 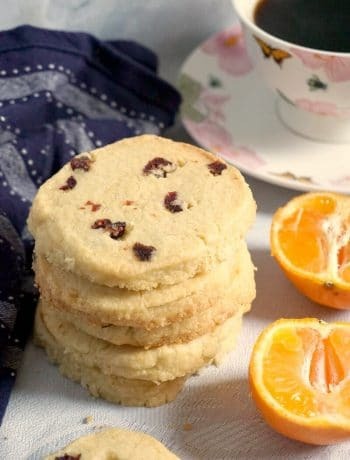 The vanilla cream filling is silky and luscious, the one and only French crème pâtissière recipe, which can be used as a base for so many other desserts, like Cremeschnitte Recipe. It’s almost a tradition now to make these cream puffs for the New Year’s Party, mum bakes them every single year without a fail. As a child I used to love giving a helping hand when making them, or shall we say licking the cream bowl clean. Still helping, right? Although mum usually choose the long shape, which would qualify them as eclairs, I prefer the round shape. Anyway, regardless of the shape, they are so delicious. How many profiteroles can you make out of a batch? 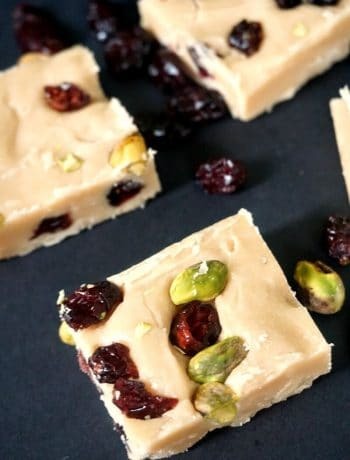 The amount I have listed below give you a pretty large batch, about 30 of them, so you will have to use 2 or 3 baking trays to make the choux pastry, or the dough. Do leave plenty of space between them, otherwise they might stick to each other. The cream filling, if you happen to have any leftover, can be easily used for any tarts. Or just sandwich some crackers together, dip them in chocolate sauce, and you’ve got a dessert in seconds. Using dessicated coconut is entirely optional, but I think they look a lot nicer with it, and get that nice extra flavour. When you make the chocolate topping, do leave it to cool down, preferably in the fridge, so it can get a chance to harden a bit, otherwise it won’t really top the cream puffs well, and you’ll end up with really messy hands when you eat them. As a general rule, the cream filling and the dough also have to be completely cool before baking and filling them. Don’t worry if the choux pastry is crispy when they come out of the oven, the soften nicely once they are refrigerated. And here you have, an indulgent dessert to treat yourself with no matter the occasion. Can you make profiteroles ahead? No time to bake them on the day of your party? They can be safely made ahead. just store the cream and glaze in the fridge, and the pastries in a cool place, and they can be filled whenever you need them. I would suggest you leave them in the fridge for at least 4-6 hours once the cream puffs have been filled, the cooler they are, the more delicious. I guarantee you, these beauties will be the star of any party. They are absolutely amazing! 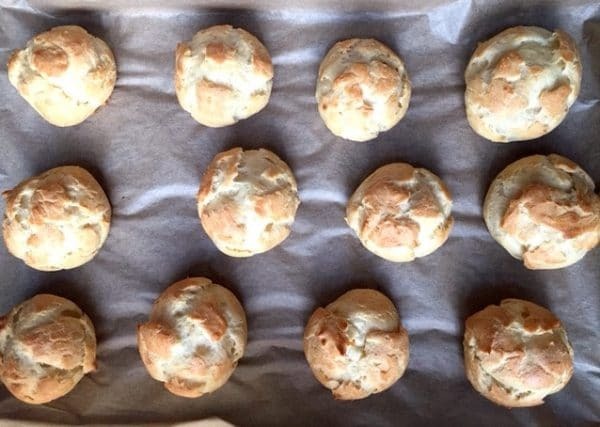 If you’ve liked my PROFITEROLES (EASY CREAM PUFFS RECIPE) or any other recipe on the blog then don’t forget to rate the recipe and let me know how you got on in the comments below, I love hearing from you! You can also FOLLOW ME on FACEBOOK, and PINTEREST to see more delicious food and what I’m getting up to. Profiteroles, a fantastic bite-size French dessert that is perfect for any party. Preheat the oven to 180 degrees C. (375 Fahrenheit). To make the pastry, mix the water, oil and salt into a pan and bring it to the boil. Remove the pan from the heat, add the flour mixing quickly with a spatula. You will get a dough-like texture. Leave it to cool. Add the eggs one by one and mix well until you get a smooth texture. You can either use a piping bag or just a spoon to scoop the mixture onto the baking trays. Make sure you leave about 2 cm between each of the pastries. Bake them at 180 degrees C for 15-20 minutes or until golden-brown. To make the filling, boil half of the milk with the sugar. In a separate bowl, mix the flour with the other half of milk. Pour the milk and flour mixture over the sugar one and simmer them until the cream thickens. Allow the cream to cool a bit, then add the butter and mix well. The cream will become really smooth and delicious. For the glaze, mix all the ingredients together. Once the pastries are ready, transfer them to a rack and allow them to cool. Half each of the pastries and fill them with cream and glaze with the cocoa powder mixture. Decorate with dessicated coconut. Delicious!!! 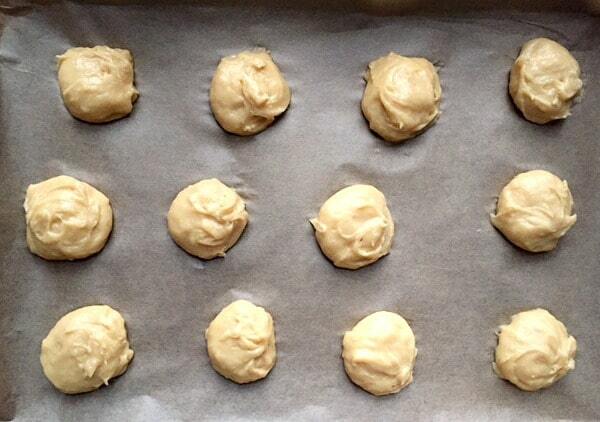 I’ve been telling myself for the past few months that I need to make eclairs – your recipe is just what I need. Thank you! They are always such a treat! 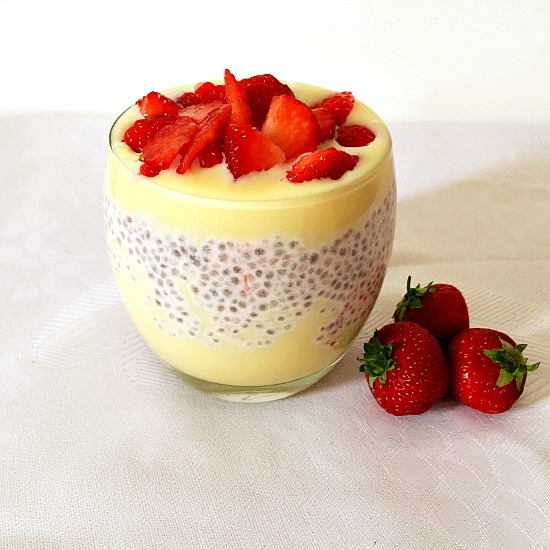 I hope you’ll enjoy the recipe! ? You’re killing me with these eclairs ! I just want to pick one up and eat it. Delish! I am glad you liked them! ? Saving you some ? I hope you’ll like them ? Thank you for stopping by and Happy New Year! I’ve never made eclairs before, because I thought they were quite complicated and fussy, but your recipe looks very straightforward and so yummy! I think I’m going to have to give them a try now. Thank you, l am sure you’ll love these éclairs. Happy New Year! These do look scrumptious! Now I have to try to make eclairs, I always thought they would be too difficult. Thanks for the recipe! I too love eclairs. These eclairs look perfect. Great recipe!! Thank you very much, l am happy that you like them ? Thank you very much! They are very populat and rightly so, they just taste so good. Thanks for stopping by! I love these Daniella…great pics too.. I haven’t made chocolate eclairs for years, but your recipe has inspired me to have a go very soon. Yours looks wonderful. Thank you! ? I hope you’ll like them, they taste amazing of left in the fridge for a few good hours. Such a great way to end the New Year. You can never go wrong with something creamy topped off with a little chocolate decadence.